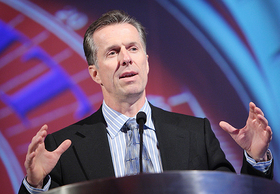 Magna's Walker says supplier has 4 areas of focus to beat industry shakeout. DETROIT -- The co-CEO of Magna International Inc. warned that as tough as industry conditions are for suppliers, he's not convinced that the industry shakeout is over. “I think there is more rationalization coming,” Magna International Inc. co-CEO Don Walker, 53, told the Automotive News World Congress on Wednesday. Navigating your way through this industry “is about knowing where you want to go and knowing how you want to get there,” Walker said. That requires tough decisions on rightsizing, streamlining and a focus on long-term competitiveness. Magna said on Wednesday it expects consolidated sales in 2010 to be between $19.5 billion and $20.5 billion, based on 2010 light-vehicle production volumes of about 10.3 million units in North America and about 11.4 million units in Europe. The company also said that its average parts content per vehicle for all of 2010 is expected to be between $895 and $925 in North America and between $545 and $570 in Europe. 1. Prioritize capital expenditures and mergers and acquisitions. 2. Capitalize on industry trends. 4. Continue to invest in innovation to drive future opportunities. In order to be successful, all four have to go hand-in-hand, he said. Walker said that if the industry is near the bottom of the cycle, it may be time to acquire weak competitors with good contracts or technology. He also described industry behavior as more cautious today than previously. Automakers are keeping a close eye on suppliers' health, he said, and governments will likely become more selective about becoming involved. Walker said the number of major suppliers could be "dramatically reduced" over the next 5 to 10 years as automakers still have excess production capacity and turn to a few financially healthy suppliers. Asked about Magna's failed attempt to buy Opel, he said Magna never had a strategy to go after automakers and added the bid was a "one-time situation." General Motors Co.'s board reversed its decision to sell a 55 percent stake in Germany-based Opel to Magna and its Russian partners, Sberbank and vehicle maker GAZ Group. Negotiations with its Russian partners have allowed Magna to expand a foothold in what is expected to be fast-growing market, he said. "We have a very good relationship with them (GAZ), and we're always looking for strategic alliances supporting them," Walker said.